There will be no tips on acclimatizing, starting, drafting and turning. Windermere One Way is an unique event, a personal challenge. So there will be no big splash start, no drafting and no turning round buoys. So here you will find plenty of practical advice complete with example sessions for you to get stuck into. 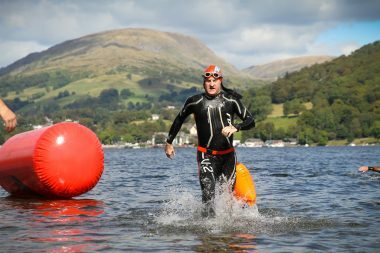 Our staff support safe open water swimming and encourages swimmers to follow the Lake Districts Swim Safe Code if you need any information on group swimming please ask. If you are swimming on your own it is a good idea to let someone know of your plans and to wear a float which may make you more visible to other water users. Lake District National Park advice on swimming.